In discussing language development in the British Isles, it is just as well to be clear that England is just one of four countries in the United Kingdom. 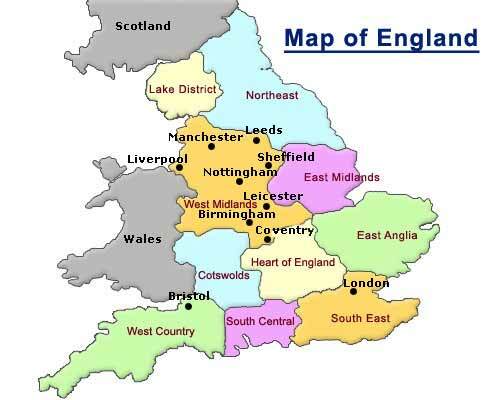 England is the biggest country in the United Kingdom. Wales lies to the west of England and Scotland is to the north. 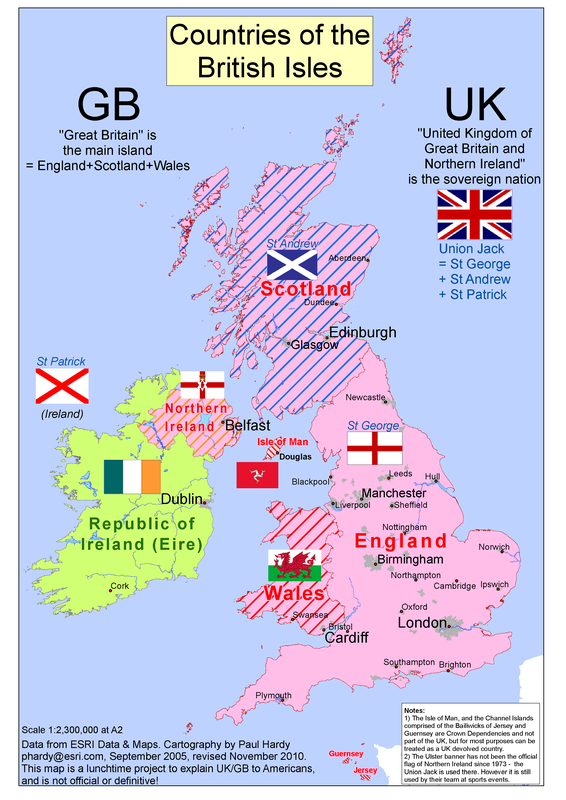 There are five countries in the British Isles: England, Scotland, Wales, Northern Ireland, and the Republic of Ireland. Ireland is part of the British Isles and has made a huge contribution to the development of the English language. However, it is not part of the United Kingdom. England is the home of the English language, although the other countries of the British Isles have each made a special contribution to its development. 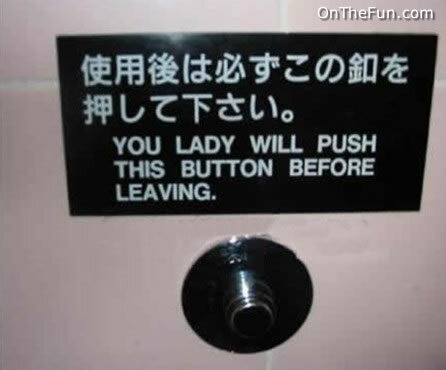 It is also important to realize that English is a relatively new language. Now it is, of course, the most powerful and influential language in the world. However, English is now also a global language and can no longer be regarded as the possession of the British or even the English people. But what was the situation before the English language even developed? We have no idea what language was used by the neolithic British who built Stonehenge. However, we do know that a group of people referred to as the Celts were dominant in western Europe about 275 BC. Yellow is where the Celts came from. Green is where the Celts spread. 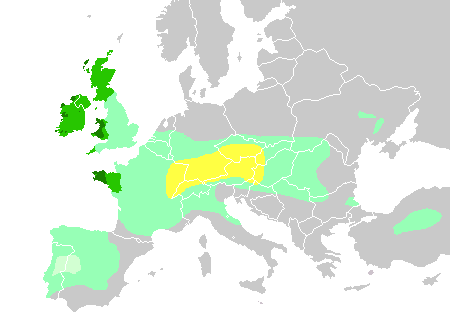 Darker green is where the Celtic languages survive today. So one of the interesting things about Britain is that not only is it the home of the most powerful and influential modern language, it is also the main area where Europe’s most ancient languages have survived. 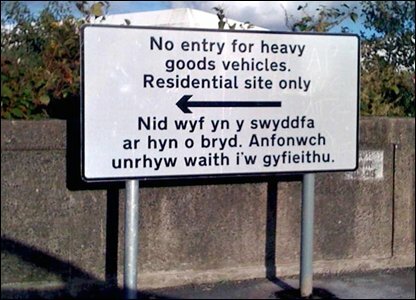 Don’t be surprised if you see signposts in two languages, one new and one ancient, if you go to the west or north of Britain. More than two thousand years ago, before the Romans arrived, the British Isles were a patchwork of Celtic tribes. Today, we recognize two branches in the language spoken by the Celts. The tribes on the eastern Island (England, Scotland, and Wales) spoke Brittonic Celtic (similar to the Welsh spoken today) and the tribes on the western island (Ireland) spoke Goidelic Celtic (similar to the Gaelic spoken in Ireland and Scotland today). The British Isles before the Romans arrived were a patchwork of Celtic tribes. The Irish Celts spoke Goidelic Celtic and the others spoke Brittonic Celtic. 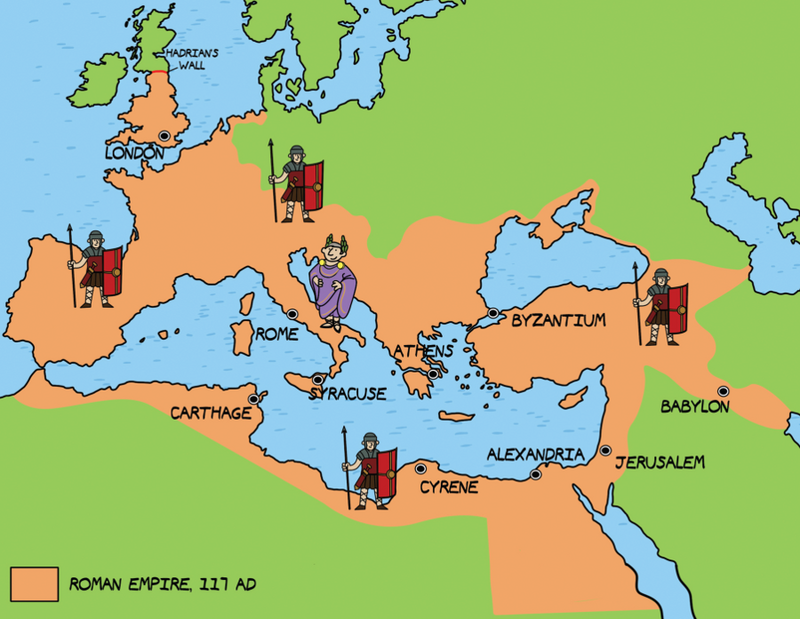 After the Romans invaded, Britain became part of the Roman Empire. However, the Romans did not invade present-day Ireland or Scotland. They actually built a wall in the north, called Hadrian’s wall, to mark the limit of their empire and help them to control it. The Goidelic Celts (present-day Ireland) and the northern Brittonic Celts (present-day Scotland) were not occupied by the Romans. While the Romans were occupying (present-day) England and Wales, the Goedelic language of Ireland (Gaelic) spread into Scotland. There was a fairly large-scale movement of people from west to east, often involving raids, and eventually Gaelic replaced the Brittonic Pictish language in Scotland. 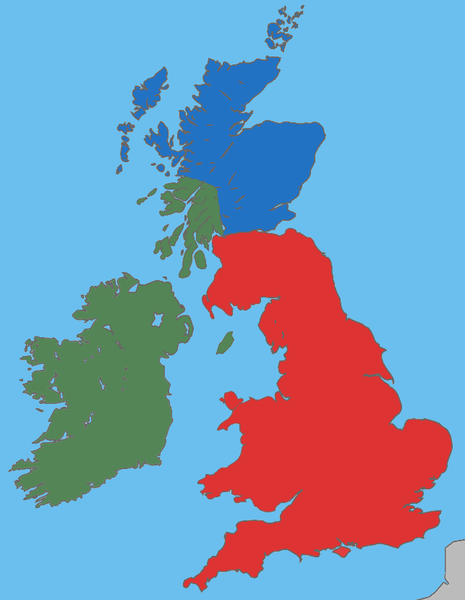 As the Romans were occupying the Brittonic-speaking areas of present-day England and Wales (red), Gaelic (green) spread from Ireland to Scotland and eventually replaced the Brittonic Pictish language (blue), which died out completely. The Romans brought many benefits to Britain, including Christianity, roads, a sewage system, new cities, and Latin influence, but eventually they left. At around the beginning of the 5th century, the Romans withdrew from Britain. 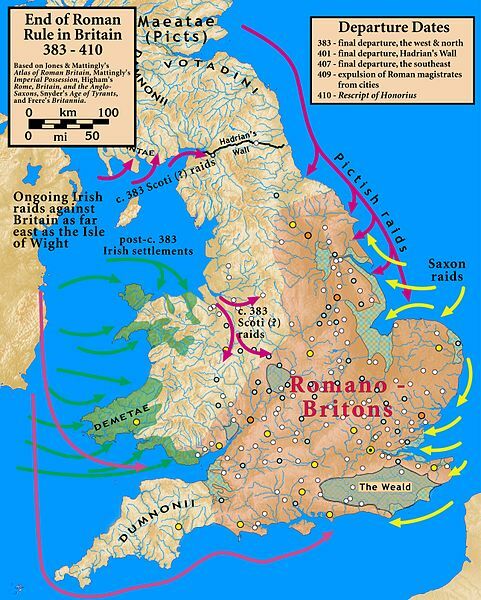 This was a terrifying time for the Romano-British Celts in England and Wales as they now had to defend themselves, and there was a threat of attack from all directions. The Celts in the old Roman Empire get attacked from all directions. The most important of these threats was from present-day Germany and Scandinavia. In fact, the invasion from these areas was to lead directly to the development of the English language.